If you’re looking for a mid-size sedan that combines exquisite styling, functionality and impressive innovation both inside and out, there’s a good chance that you’ll take a liking to the two vehicles we have on display today; the 2017 Mazda6 and 2017 Toyota Camry are two vehicles that have formed great reputations in the automotive market for their consistency in areas like performance, efficiency and tech savviness, just to name a few. But how well do they match up with each other? 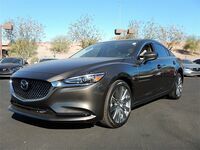 Our team here at Avondale Mazda wants to help your car buying experience be a little easier and more informative, so we did some research on the Mazda6 and Camry. Without further ado, let’s jump right in and see what these two mid-size giants bring to the table for you and your family! 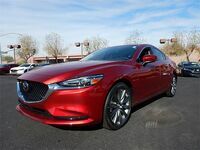 For those who desire the best in automotive quality, it’s clear that both the 2017 Mazda6 in Avondale AZ and 2017 Toyota Camry can give you exactly what you’re looking for for the right price. Both can deliver impressive fuel efficiency for a value that works for any kind of driver and available budget, but if you’re looking for that right combination of power and technology, the Mazda6 is definitely worth a second look. Not only does its 2.5-liter SKYACTIV®-G Inline 4 engine provide greater horsepower and torque output than that of the Camry, but its standard G-Vectoring Control helps to create one of the smoothest and most responsive driving experiences on four wheels. Stepping inside, the MazdaConnect™ infotainment system allows you to seamlessly integrate your compatible smartphone for hands-free communication, navigation and media streaming, feats unmatched by many vehicles on the market. Altogether, the Mazda6 is more than capable of providing a feeling that will stay with you far beyond the road. If you’re interested in learning more about the 2017 Mazda6 and its features, feel free to contact our sales team at Avondale Mazda. We’re more than happy to help you get behind the wheel for a test drive and even work out a financing deal. Stop in and see our team today!